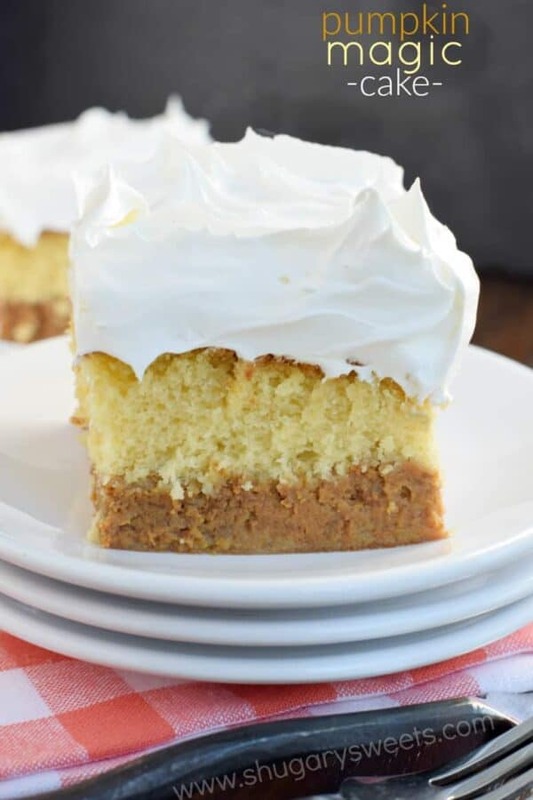 Look at those beautiful layers in this Pumpkin Magic Cake! 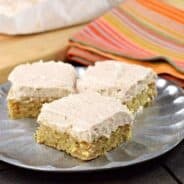 This is a must make recipe for the holidays! I’m sorry were you thinking something more political? This is a food blog after all, can’t get too crazy. However, whenever I mention I use Cool Whip, I feel like there is a bit of judgement handed down upon me. As if I’m feeding my children arsenic. I grew up eating Cool Whip on our pumpkin pies. I’m sorry, it’s true. On Thanksgiving, Grandma would put out a tub of the white, creamy stuff and a can of whipped cream (nobody thought twice about making homemade whipped cream..). I always chose the Cool Whip. Sorry friends, it pairs wonderfully with pumpkin pie. If you prefer to not eat it, that’s cool. Here’s a recipe for a homemade whipped cream. Shawn has a pudding frosting to top her cake, but I skipped that for my end result and just used Cool Whip (remember, I love it on pumpkin pie)! This cake is making an appearance on our Thanksgiving table because we LOVED it so much!! And it’s truly a magic cake. Start with your cake mix layer. Pour in your pumpkin pie mixture. While the cake bakes, the two layers magically separate. When you remove the cake from the oven you’re going to think to yourself, “I did something wrong, it doesn’t look separated.” Trust me. Wait until you slice into the cake to make that call, it will WORK. 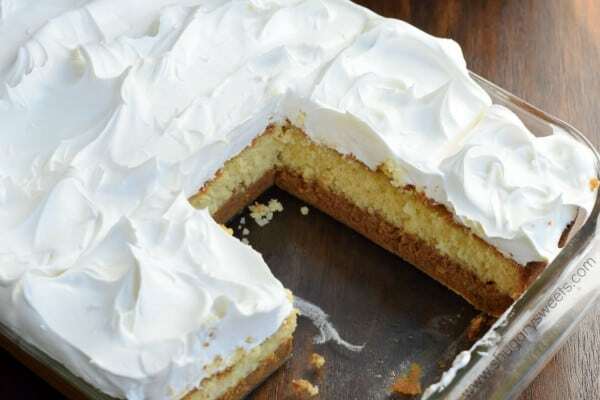 Be sure to cool and chill this cake COMPLETELY before topping it with frosting (or Cool Whip). Serve cold and enjoy! 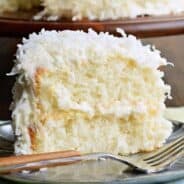 Looking for more cake recipe ideas? I’ve got you covered! 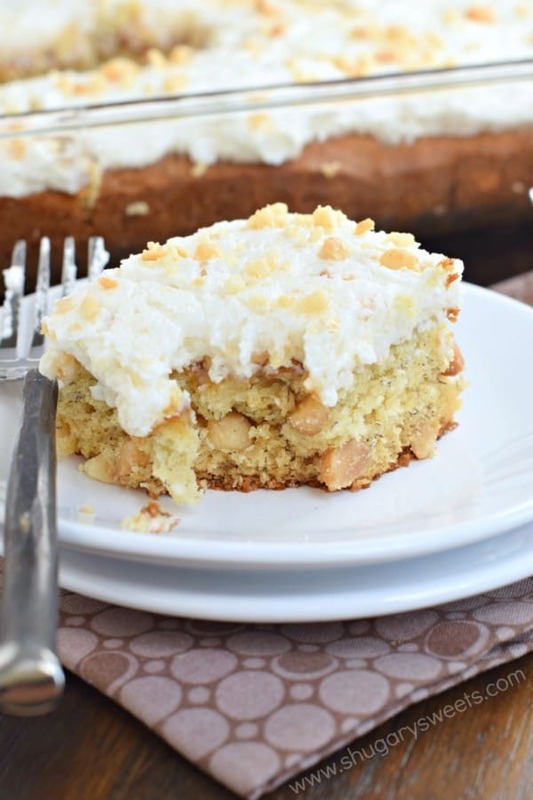 Banana Macadamia Nut Cake: If you love banana snack cakes…and macadamia nuts, then this cake is just for you! 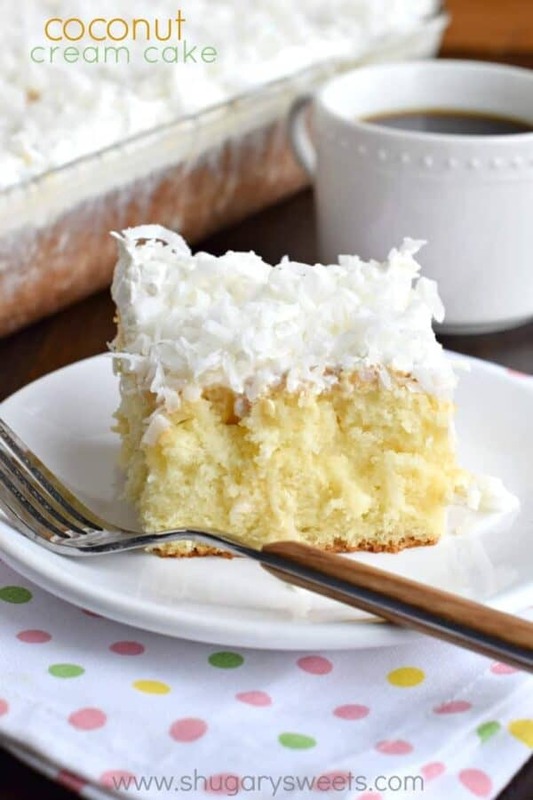 Coconut Cream Poke Cake: a sweet treat at the end of your meal! 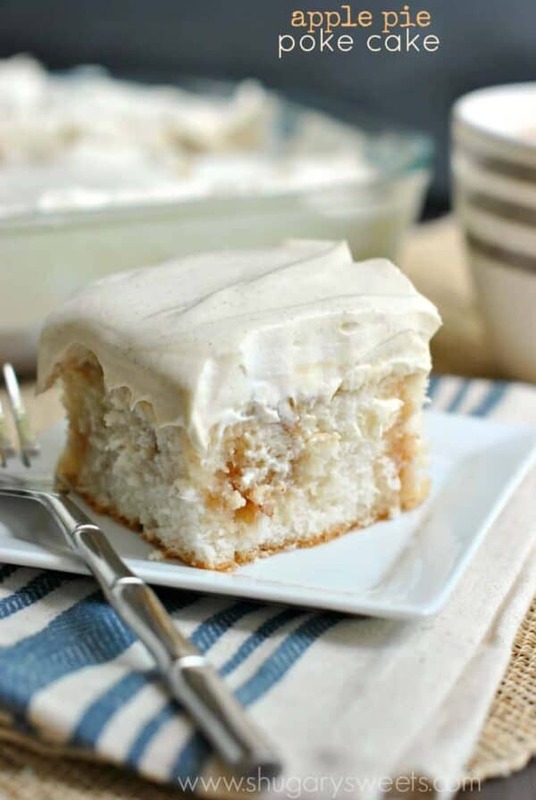 Apple Pie Poke Cake: this sweet cake is a cross between a classic pie and a moist cake. A family favorite!! Preheat oven to 350 degree F. Spray 13x9 baking dish with non-stick baking spray. Set aside. Prepare cake layer by blending ingredients together until smooth. Beat 2 minutes and pour into prepared baking dish. For the pumpkin layer, combine ingredients and beat until smooth. Pour into cake layer. Pumpkin will sink down to the bottom, as it should. No need to swirl or smooth. Bake for 60 minutes. Remove from oven and cool completely. The cake will look a little more "done" than usual, that's okay. 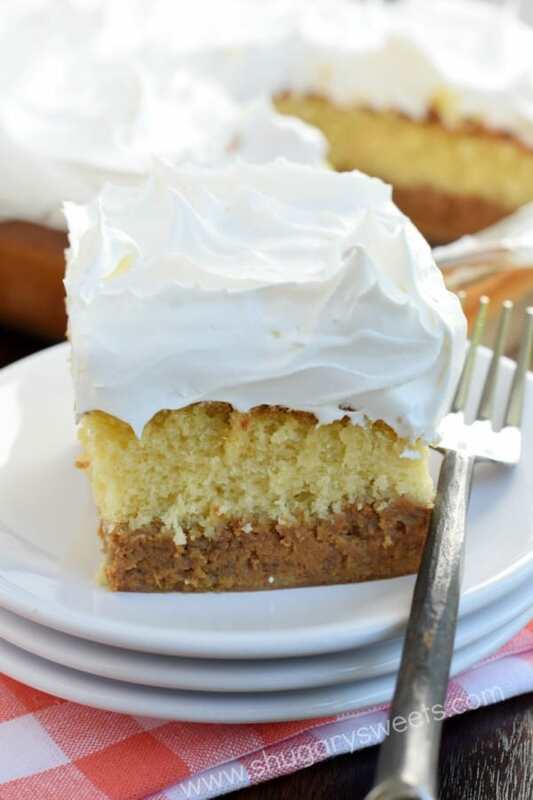 Frost cooled cake with Cool Whip and refrigerate until ready to serve (at least 4 hours or overnight). ENJOY! If you want to try Shawn's original frosting recipe, check it out here! It's worth trying! LOVE this creative recipe!! You are so smart!! Your cake looks delicious! I prefer to eat homemade whip cream but I like the convenience of Cool Whip. I’m pretty sure we also had the whipped product in the cans with the pressurized tip when I was growing up. Not sure what that product is but it sure was fun. Anyway, since neither is a product we eat regularly, I do whatever works for me at the time. I have been using and eating Cool Whip for years. I like the convenience and the taste. 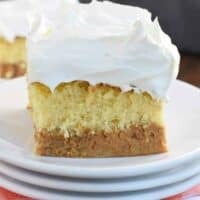 It looks like it would be great on this Pumpkin Magic Cake. I can’t wait to try the recipe and the Cool Whip topping!! There are times when Cool Whip rules! or when Whipped Cream in a can does, or when homemade does. It depends on the application and the other flavors involved. I want this cake right now!!! Thanks for sharing and as always ‘the haters gonna hate’. Looks awesome but I think I’m going to try chocolate cake mix, do you think that would work? Definitely! I love chocolate and pumpkin together! Cool Whip is magic, Aimee. Everyone just needs to calm the hey down. Like, we’re not mainlining it every day, right? Balance! Moderation! Cool Whip on holidays! And sometimes on ordinary, hard to handle days! This cake is magic, too. I want it on my Thanksgiving table, along with all the things! Give me Cool Whip any day!! It’s the BEST. Love this cake! Hi there ! Wondering what your thoughts are on making this cake in a Bundt pan? Will it keep form? Or is pumpkin more liquid? Yes, pumpkin puree. NOT canned pumpkin PIE. How “done” is overdone looking? Will the top be crispy or just a little extra brown as opposed to yellow? I’ve just started cooking and baking with a gas range and am still getting used to how the oven bakes things. Which actually seems to be a lot slower than my old electric oven. Want to know what I should be looking for so it’s not undercooked. Thank you! The top should look like a regular yellow cake….but the center will appear “jiggly” Hope this helps! O this look nice. Will have to give it a try. Looks very creamy. We love this cake too!!! 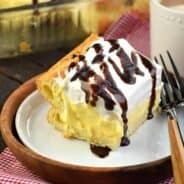 Such a great fall dessert! Best pumpkin dessert I have ever tasted. Five stars.